Cores coming back into stock? Are Axoloti Cores expected back in? The site says they're out of stock, and that orders placed today will ship December 21. I remember Johannes was trying to get shipments out for Christmas. I hope sales were strong, and I hope more are coming in! I've got another idea I want to try! It's sort of a new tradition for me. Every new year i need my three new Axoloties. I hope they will come back soon and that @johannes is fine and doing well. I think that everybody understands that producing such a nice device can be challenging sometimes and that multiple issues can occur (components availability, production failure...) and cause delays. hmm, for a couple of days now, there is not even the option to place a preorder or something...has it always been that way? (i seem to remember that there was a preorder button once) luckily i bought two boards second hand for cheap about 4 months ago. i definitely want to buy a few too. i do hope they come back in to stock before too long. Same here: how do I order/pre-order? New stock expected on Feb 15. No pre-orders, there will be plenty. I guess that answers all the questions here. It seems to only say “Out of Stock” right now. Well, here’s hoping! I want to buy one for my niece! New units are expected for Feb 15. Axolotis are back in stock!!! Just ordered 3 new ones! I thought about ordering two. And then it said "only 1 in stock". Quickly ordered it. Now it's "out of stock" again. Sorry. But also feel lucky to have snatched the last one of the batch. I hope more are in the pipeline. Strange definition of "plenty" indeed, otherwise. EDIT: Ok, it seems it's back now. Maybe Johannes just set the available number wrong in the web store. 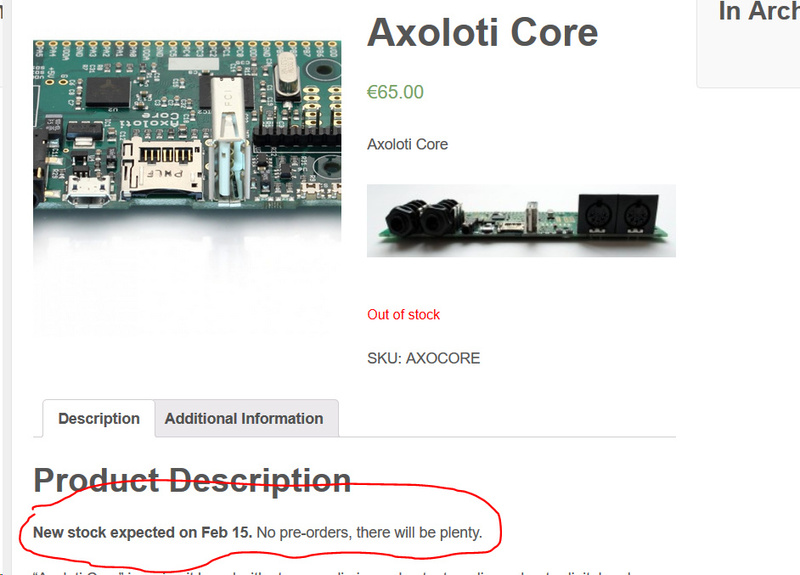 Right now, I just ordered 4 Axoloti Cores!! I will proceed to make and send a new batch of clear acrylic enclosure for Axoloti to send to the AMAZON warehouses. Soon they will be in the other AMAZON sites.